I was born in 1971. Oops. Personally, I long for the days of the 1950s. Before depletion hit, before extreme pollution hit, when the world had half the people or less. When we had a smiling nice guy and a war hero for President. 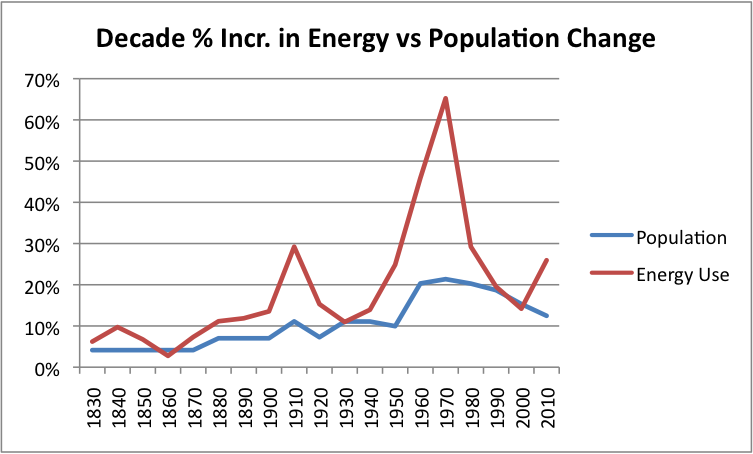 Per capita energy use was much lower. Stratocasters were new. We had our own US culture, and the border patrol rounded up and deported all the illegals. There were no friggin mosques in this country(so few that most didn't know about them--the precursors of over 1300 now, enemy enclaves). Superman was on TV fighting for truth, justice, and the American Way. We made good progress after that first Earth Day in 1970, people started using less power per capita and had fewer kids. Until the effects of immigration hit and stupid economists unduly influenced rose colored glasses wearing Presidents. Last edited by Johhny Electriglide on Sat Mar 17, 2012 11:53 am, edited 1 time in total. sorry I will interpret what I saw in the graph: when the population increase per year increased, it is either babies or immigration. Being that the second increase (1950-1960 on the graph) roughly matches the "Post–World War II baby boom" and matches a dramatically higher amount of percentage of yearly energy use increases, it shows to me that the need for more energy in a home can be caused by child-rearing activities. Washing machines, water use, packaged foods and dairy products, keeping all parts of the house warm, lights at night, driving kids around... yeah I can see all sorts of increases in energy use. You can tell the difference when one is speaking literally vs figuratively, right? Of course not, that is why I have you to watch out for me on those things.